Your pic of the mark has too much "back flash" in it to read it. 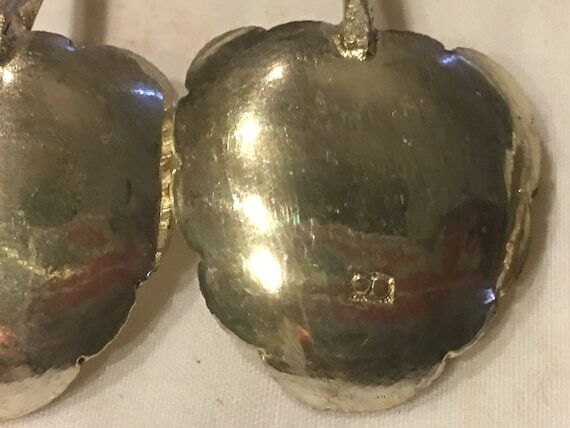 I believe it reads "800" which is the mark for Sterling Silver in some, mostly European, countries. "925" is used in the USA, UK and others. 800 is the percentage of pure silver in it, or 80%. And 92.5%. Your mark plainly reads "INDONESP" probably Indonesia, which consists of several island areas of Java which is confirmed in the link provided. Note that the link is asking $39.95 for 1. You have 6. They appear to be equal in all respects which indicates machine made, not handmade. When the link opens use the slide bar to see all 7 pictures. Thanks Tom but they're not silver -- I know silver as I handle it frequently. 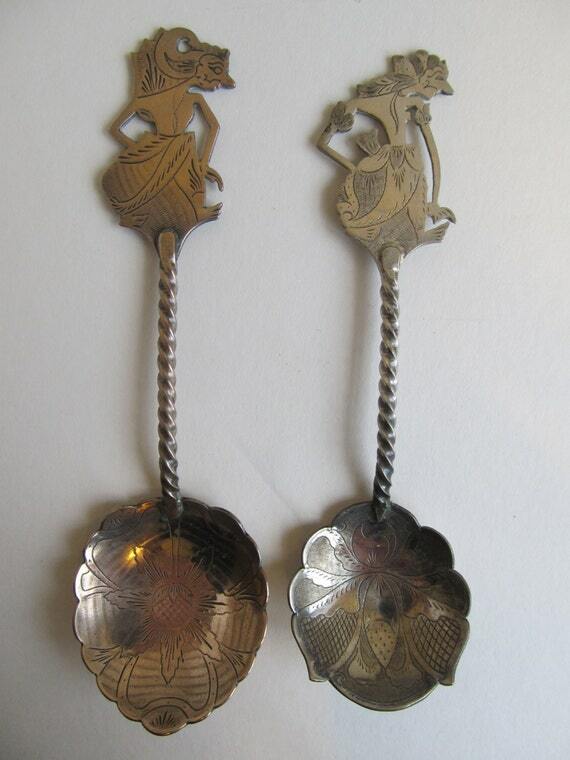 The spoons are very lightweight and crudely made so not as nice as the ones in the link obviously. Thanks for spotting the name INDONESIA - it's quite clear now I know! 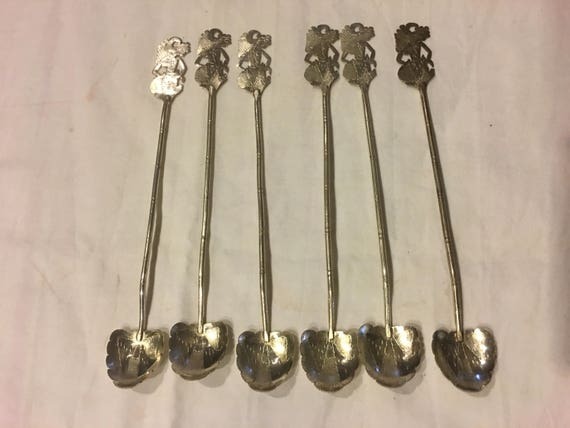 I would have to agree with Tom, they do indeed appear to be silver, the marking correspond, silver can indeed be lightweight for items this style, there are numerous examples of these spoons online all bearing the similar end design and 800 marking which is indicative of silver. Being hand-made, which can be observed through the subtle variations in the shape outline and from observations in closeup, is a simple enough reason to understand why so many variations on the theme exist. 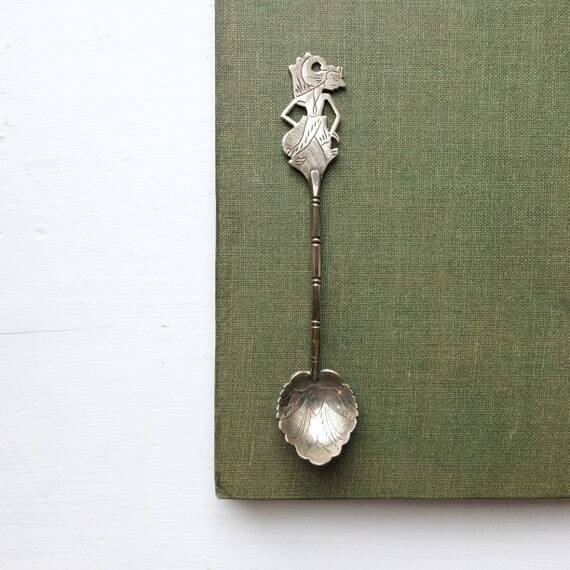 The discolouration of your spoon set is possibly simple tarnish. All that said, if you find you have a non-silver knock-off set in the Wayang Kulit Puppet design, then it is still an interesting set. Do a silver test, or simply try to polish one up. Just be aware, if it is silver, not all collectors prefer the tarnish removed and feel it is devalued in some way. Personally, I feel leaving tarnish aka corrosion, unchecked is a ridiculous notion as it reduces the lifespan of the piece's original condition. 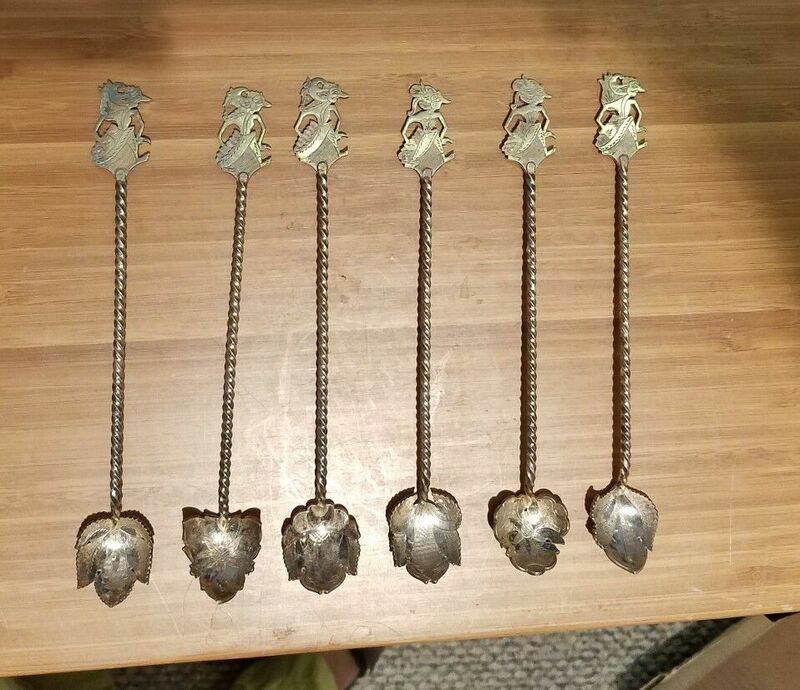 If you look at the Etsy link I sent above, you will see in the descriptive photos below the spoons, the set of circles you guys are saying means "800"...but on these, very similar spoons, there are only two dots? Jeannine? Did you ever tell us how many of these spoons you actually have? For whereas Tom said just one was selling for $40, (the link actually says $30)...and the link I sent you has six of them selling for $52 for all? The ones I showed you even have the sellers questioning the metal and they are 7" long. I think there are quite a few of these Wayang Kulit Puppet designs roaming around out there. Even the shape of the Jeannine's spoons appear to be more rounded than any of the ones we've located to compare them to....Hmmmm. These turn up fairly often in the UK and while you do get genuine silver one's 9 times out of 10 the 800 stamp is misleading at best!